Though matcha traces back over thousands of years, it has grown to be quite the fashionable food trend in the modern-day health world. Learn what makes matcha so great and how to use it in the comfort of your own home! Matcha is a high-grade green tea powder traditionally consumed in Japanese culture and produced from the tea plant Camellia sinensis. The cultivation of matcha is vastly different than any other teas available and is more labor intensive. Matcha is also grown in the shade, which increases the amount of chlorophyll it contains and gifts its bright green color. Ceremonial grade is the highest quality of matcha produced and often hard to find outside of Japan. Its producers give it the most attention to detail during processing to yield the freshest, most delicate tasting, and smoothest ground matcha to exist. Ceremonial grade is meant to be enjoyed and appreciated in its purest form without any sweeteners or other additives. Premium grade has more of an everyday use, along with baring a quality taste whilst being easier to locate than ceremonial grade. Commonly known as ingredient grade, culinary grade matcha is used more often in the kitchen. 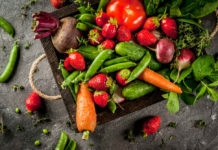 Its robust, astringent flavor can stand up to other ingredients it becomes paired with, while also being a more affordable ingredient to purchase and stock. Green tea is well-known for its polyphenols it contains, which are phytochemicals found in plant sources exposing highly potent antioxidant properties. Catechins, which are a type of polyphenol, are more robust in green tea compared to black and oolong varieties. Catechins are further broken down into subtypes, though the most potent in green tea is epigallacatechin-3-gallate (EGCG), with one cup of green tea generally containing 100 to 200 milligrams. But since matcha powder is whisked into hot water, rather than steeped and extracted from a tea bag, it retains its unmatched nutritional profile. In fact, evidence shows the EGCG available from drinking matcha is almost 140 times greater than the amount of EGCG available from China Green Tips green tea and at least three times higher than the largest values of other green teas! Matcha also generally supplies more caffeine compared to other teas, though the actual quantity depends how the matcha was processed and prepared. Matcha tea for weight loss is perhaps one of the most sought out uses of the green drink. But does it actually stand up to its hype? Research published in the American Journal of Clinical Nutrition suggests so! The findings? Green tea increased energy expenditure and promoted fat oxidation even beyond its caffeine content, thus postulating the extract may play a role in the control of body composition and weight loss. And with weight being a significant risk factor for developing type 2 diabetes, green tea may lessen diabetes risk by supporting weight loss. The rich concentrations of the green tea may also be effective in protecting from a number of chronic diseases, including diabetes, heart disease, cancer, Alzheimer’s disease, rheumatoid arthritis, and psoriasis. A 2017 study investigated the the effects of caffeine, L-theanine, and EGCG on mood and cognitive performance. 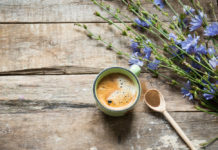 After reviewing 49 human intervention studies, researchers found L-theanine alone improved self-reported relaxation, tension, and calmness starting at 200 mg. L-theanine was also found to lead to relaxation by reducing caffeine induced arousal. Furthermore, a combo of L-theanine and caffeine improved performance in attention-switching tasks and alertness. 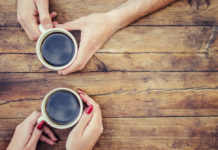 These studies provided reliable evidence showing L-theanine and caffeine have clear beneficial effects on sustained attention, memory, and suppression of distraction. 1. Sift a teaspoon of matcha powder into a bowl. 2. Add a splash (about a tablespoon) of the the hot water and whisk rapidly in a zigzag motion until the mixture is free of clumps and forms a thin paste. 3. Add the rest of the water, also feeling free to add more or less to desirable consistency. 4. Sip straight from the bowl or pour into your favorite mug and sip sip hooray! Okay, matcha tea is great and all… But we also like this matcha drink a latte! Start by preparing the traditional matcha tea, but scaling back to only a tablespoon of water and stopping at step #2. Swap out the hot water with hot milk, including cow, coconut, and cashew varieties. Pour milk into the matcha mixture and serve. You can also add sweetener to taste, along with elevating flavor with vanilla bean pods and cinnamon. Frothing the milk with a frother by mixing it in a blender also results to foamy and smooth consistency desired from a latte. Shake up your breakfast repertoire with a matcha smoothie bowl! 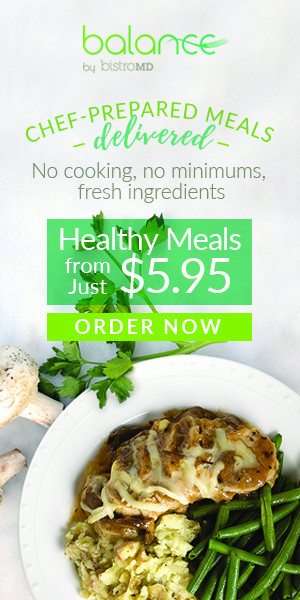 Not only is it packed with nutrients, but simple and delicious! Toppings are up to your discretion, though inspirational flavors and textures include strawberries, blueberries, cinnamon, pecans, coconut shreds, flaxseeds, and a nut butter. Add the bowl ingredients into a blender and mix until completely smooth. Transfer to a bowl and top with whichever ingredients you enjoy and have on hand! 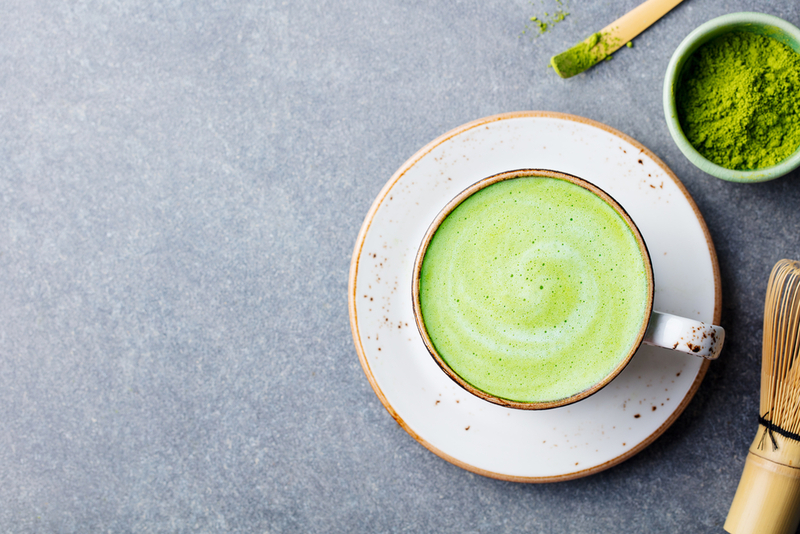 Matcha supplies approximately 70 milligrams per cup and according to the Mayo Clinic, up to 400 mg of caffeine a day appears to be safe for most healthy adults. Exceeding 400 mg may cause jitteriness, headaches, insomnia, irritability, fast heartbeat, restlessness, and an upset stomach. To lower the risk of such negative consequences, limit matcha to five cups daily (which also assumes matcha is the only form of caffeine). Along with considering the caffeine content, be sure to moderate the intake of added sugar and other ingredients used to prepare the tea, latte, cookies, ice cream, and other matcha recipes. 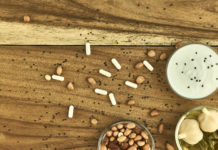 The caffeine and other components of matcha and green tea can interfere with a number of medications, including some stimulants, antibiotics, antipsychotics, antidepressants, and blood thinners.